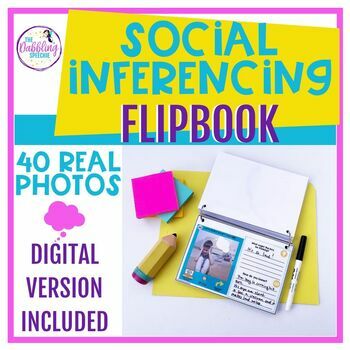 The Best of Teacher Entrepreneurs III: Making Social Inferences FLIPBOOK! This is a great interactive flip book! It is perfect for teaching students to look for clues to make smart guesses about what people may be thinking or feeling. Perfect for social skill groups or teaching students to "cite" evidence. Just laminate, punch holes at the top and connect with binder rings. Use a dry erase marker to answer the questions. Grab this pack in my store!